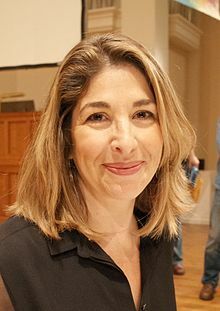 Naomi Klein (born on 8 May 1970) is a Canadian author, social activist, and filmmaker known for her political analyses and criticism of corporate globalization and of corporate capitalism. Decades from now, if we are exquisitely lucky enough to tell a thrilling story about how humanity came together in the nick of time to intercept the metaphorical meteor, the pivotal chapter will not be the highly produced cinematic moment when Barack Obama won the Democratic primary and told an adoring throng of supporters that this would be “the moment when the rise of the oceans began to slow and our planet began to heal.” No, it will be the far less scripted and markedly more scrappy moment when a group of fed-up young people from the Sunrise Movement occupied the offices of Pelosi after the midterm elections, calling on her to get behind the plan for a Green New Deal — with Alexandria Ocasio-Cortez dropping by the sit-in to cheer them on. Those could be the famous last words of a one-term president, having wildly underestimated the public appetite for transformative action on the triple crises of our time: imminent ecological unraveling, gaping economic inequality (including the racial and gender wealth divide), and surging white supremacy. What haunts me is not exactly the absence of literal space so much as a deep craving for metaphorical space: release, escape, some kind of open-ended freedom. The title No Logo is not meant to be read as a literal slogan (as in No More Logos! ), or a post-logo logo (there is already a No Logo clothing line, or so I'm told). Rather, it is an attempt to capture an Anticorporate attitude I see emerging among many young activists. This book is hinged on a simple hypothesis: that as more people discover the brand-name secrets of the global logo web, their outrage will fuel the next big political movement, a vast wave of opposition squarely targeting transnational corporations, particularly those with very high name-brand recognition. Introduction, "A Web of Brands"
So, if consumers are like roaches, then marketers must forever be dreaming up new concoctions for industrial-strength Raid. With the tentacles of branding reaching into every crevice of youth culture, leaching brand-image content not only out of street styles like hip-hop but psychological attitudes like ironic detachment, the cool hunt has had to go further afield to find unpilfered space and that left only one frontier: the past. In many ways, schools and universities remain our culture's most tangible embodiment of public space and collective responsibility. University campuses in particular —with their residences, libraries, green spaces and common standards for open and respectful discourse - play a crucial, if now largely symbolic, role: they are the one place left where young people can see a genuine public life being lived. And however imperfectly we may have protected these institutions in the past, at this point in our history the argument against transforming education into a brand-extension exercise is much the same as the one for national parks and nature reserves: these quasi-sacred spaces remind us that unbranded space is still possible. Chapter Four: "The Branding of Learning"
While brands slowly transform the experience of campus life for undergraduates, another kind of takeover is under way at the institutional research level. All over the world, university campuses are offering their research facilities, and priceless academic credibility, for the brands to use as they please. As we look back, it seems like willful blindness. The abandonment of the radical economic foundation of the women's and civil-rights movements by the conflation of causes that came to be called political correctness successfully retrained generation of activists in the politics of image, not action. Chapter Five: "The Patriarchy Gets Funky"
Despite different cultures, middle-class youth all over the world seem to live their lives as if in a parallel universe. They get up in the morning, put on their Levi's and Nikes, grab their caps and backpacks, and Sony personal CD players and head for school. Like so much of cool hunting, Hilfiger's marketing journey feeds off the alienation at the heart of America's race relations: selling white youth on their fetishization of black style, and black youth on their fetishization of white wealth. Rather than calling attention to the house of mirrors, that passes for empirical truth (as postmodern acadimics did), and rather than fighting for better mirrors (as the ID warriors did), today's media activists are concentrating on shattering the impenetrable shiny surfaces of branded culture, picking up the pieces and using them as sharp weapons in a war of actions, not ideas. When we lack the ability to talk back to entities that are culturally and politically powerful, the very foundations of free speech and democratic society are called into question. Culture jamming is enjoying a resurgence, in part because of technological advancements but also more pertinently, because of the good old rules of supply and demand. Something not far from the surfaces of the public psyche is delighted to see the icons of corporate power subverted and mocked. There is, in short, a market for it. With commercialism able to overpower the traditional authority of religion, politics and schools, corporations have emerged a the natural targets for all sorts of free-floating rage and rebellion. The new ethos that culture jamming taps into is go-for-the-corporate-jugular. Too often, however, the expansive nature of the branding process ends up causing the event to be usurped, creating the quintessential lose-lose situation. Not only do fans begin to feel a sense of alienation from (if not outright resentment toward) once-cherished cultural events, but the sponsors lose what they need most: a feeling of authenticity with which to associate their brands. Since many of today’s best-known manufacturers no longer produce products and advertise them, but rather buy products and “brand” them, these companies are forever on the prowl for creative new ways to build and strengthen their brand images. Extreme violence has a way of preventing us from seeing the interests it serves. The parties with the most gain never show up on the battlefield. The widespread abuse of prisoners is a virtually foolproof indication that politicians are trying to impose a system--whether political, religious or economic--that is rejected by large numbers of the people they are ruling. Just as ecologists define ecosystems by the presence of certain "indicator species" of plants and birds, torture is an indicator species of a regime that is engaged in a deeply anti-democratic project, even if that regime happens to have come to power through elections. When it comes to paying contractors, the sky is the limit; when it comes to financing the basic functions of the state, the coffers are empty. The American Society of Civil Engineers said in 2007 that the U.S. had fallen so far behind in maintaining its public infrastructure -- roads, bridges, schools, dams -- that it would take more than a trillion and half dollars over five years to bring it back up to standard. Instead, these types of expenditures are being cut back. At the same time, public infrastructure around the world is facing unprecedented stress, with hurricanes, cyclones, floods and forest fires all increasing in frequency and intensity. It's easy to imagine a future in which growing numbers of cities have their frail and long-neglected infrastructures knocked out by disasters and then are left to rot, their core services never repaired or rehabilitated. The well-off, meanwhile, will withdraw into gated communities, their needs met by privatized providers. “Like Russia's gangsterism and Bush's cronyism, contemporary Iraq is a creation of the fifty-year crusade to privatize the world. Rather than being disowned by its creators, it deserves to be seen as the purest incarnation yet of the ideology that gave it birth. Regardless of the overall state of the economy, there is now a large enough elite made up of new multi-millionaires and billionaires for Wall Street to see the group as "superconsumers," able to carry consumer demand all on their own. During the Cold War, widespread alcoholism was always seen in the West as evidence that life under Communism was so dismal that Russians needed large quantities of vodka to get through the day. Under capitalism, however, Russians drinks more than twice as much alcohol as they used to - and they are reaching for harder painkillers as well. The theory of economic shock therapy relies in part on the roleof expectations on feeding an inflationary process. Reining in inflation requires not only changing monetary policy but also changing the behavior of consumers, employers and workers. The role of a sudden, jarring policy shift is that it quickly alters expectations, signaling to the public that the rules of the game have changed dramatically - prices will not keep rising, nor will wages. The dirty secret of the neoliberal era is that these ideas were never defeated in a great battle of ideas, nor were they voted down in elections. They were shocked out of the way at key political junctures. The recent spate of disasters has translated into such spectacular profits that many people around the world have come to the same conclusion: the rich and powerful must be deliberately causing the catastrophes so that they can exploit them. No country offered more lucrative conditions than China: low taxes and tariffs, corruptible officials and, most of all, a plentiful low-wage workforce that, for many years, would be unwilling to risk demanding decent salaries or the most basic workplace protections for fear of the most violent reprisals. This is what Keynes had meant when he warned of the dangers of economic chaos—you never know what combination of rage, racism and revolution will be unleashed. As a means of extracting information during interrogations, torture is notoriously unreliable, but as a means of terrorizing and controlling populations, nothing is quite as effective. Naomi Klein's home page. Retrieved on 23 October 2018. Naomi Klein's twitter page. Retrieved on 23 October 2018.